* O mystery brought about on earth! After the birth, Anna prayed to our God and Maker Who knows all things in advance: "You have heard me, O Lord, as you have heard Hannah who was accused before Eli of being drunk" [1 Sam. 1:14]. She promised Samuel, after his birth, to the Lord to become priest. Just as formerly you have given me too a gift, the barren woman gives birth to the Mother of God and the nurse of our life. * In your holy birth, Immaculate One, Joachim and Anna were rid of the shame of childlessness; Adam and Eve of the corruption of death. And so your people, free of the guilt of their sins, celebrate crying: "The barren one gives birth to the Theotokos, who nourishes our life." * Consequently, the tribes of Israel heard that Anna had given birth to the pure Virgin, and they all rejoiced with great gladness. Joachim held a great feast and celebrated splendidly the miraculous birth. And when he had summoned to prayer the priests and the Levites, he placed Mary in the midst of all, in order that she be magnified. * O Bride of the Father, immaculate Mother of the Son, and holy and resplendent temple of the Holy Spirit; O most chaste of all creation, most suitable to His ultimate purpose, on this account the universe was created and, by thy birth, was the eternal will of the Creator fulfilled. *O Lord, you have opened the womb of Sarah, giving her Isaac as fruit in her old age. Today, O Savior, you have likewise given to godly Anna a fruit born from her womb, even your own Mother without spot. * She is the treasure of virginity, the rod of Aaron springing from the root of Jesse, the preaching of the prophets, offshoot of the righteous Joachim and Anna. She is born, and with her is the world become new again. She is born, and the Church clothes herself in majesty. She is the holy temple, the receiver of the Godhead: the instrument of virginity, the bridal chamber of the King, wherein was accomplished the marvelous mystery of the ineffable union of the natures which come together in Christ. * As foretold by the angel, today have you come forth, O Virgin, the all-holy offspring of righteous Joachim and Anna...you did destroy the curse and give blessing in its place. * No more are the gifts of Joachim turned away: for the lament of Anna is changed to joy. "Let all the chosen of Israel rejoice with me," she says, "for behold, the Lord has given me the living Pavilion of His divine glory, unto the joy and gladness of us all and the salvation of our souls. 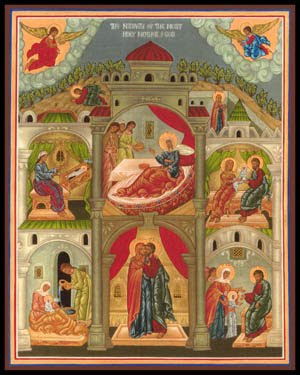 * The day of the Nativity of the Theotokos is the feast of joy for the whole world, because through the Theotokos the entire human race was renewed and the grief of the first mother Eve was changed into joy. For whereas the latter heard the divine statement, “In pain you shall bring forth children” [Gen. 3:16] the former heard, “Rejoice favoured one!” [Luke 1:28]. The latter heard, “Your recourse shall be towards your husband!” and the former, “The Lord is with you!" * The holy parents of the Mother of God received from heaven a gift worthy of God, a throne higher than the very cherubim [Is. 6:1; Ez. 1:4] -- she who in childbirth would bear the Word of the Creator. * The Mother of God was born to us at the holy Sheep Gate. Rejoice, O Sheep Gate, the most holy temple of God's Mother. Rejoice O Sheep Gate, the wall of Joachim's sheep. * Eve declares her daughter and descendent blessed, "for unto me is born deliverance, through which I shall be set free from the bonds of hell." * The present feast honoring the birth of the Virgin Mother of God easily carries off the glittering prize of seniority against every competitor...for without the Virgin's feast none of those that sprang out would appear...The Virgin's feast, in fulfilling the function of the root, the source, the foundation...takes on with good reason the ornament of all those other feasts, and it is conspicuous with many great boons, and is recognized as the day of universal salvation. * After God had bestowed on man the enjoyment and mastery over everything in the Garden, it was meet for him who was entrusted with so great authority to be disciplined and trained with some command. However, after transgressing this command, the Creator did not overlook His creatures though they had plunged themselves into such great error. It was needful, therefore, that one Person of the Trinity become man, to make it manifest that the recreation too, like the creation, was their own work. Incarnation entailed a pregnancy and a mother. So it was needful that a mother should be prepared down below for the Creator, for the recreation of shattered humanity. She was to be a virgin, just as the first man had been formed of virgin earth; so the recreation too should be carried out through a virgin womb, and that no transitory pleasure, even lawful, should be as much as imagined in the Creator's birth; for the Lord suffered to be born for the deliverance of him who was a captive of pleasure. Who then was worthy? Clearly it was she who this day strangely issued from Joachim and Anna, the barren root. It was needful, yea needful, that she who from the very cradle had by a superior reason preserved her body pure, her soul pure, her thoughts pure, should be marked out to be the Creator's Mother. It was needful that she who had been brought to the temple as an infant, who had trodden the untrodden places, should appear as a living temple for Him Who gave her life. It was needful that she who had been born in a wondrous manner from a sterile womb, and had removed her parents' reproach, should also make good the failure of her forefathers; for she, the descendent, was able to repair the ancestral defeat, who brought forth the Savior of our race by a husbandless birth, and molded His body. * The Lord's throne (Mary) is being prepared on earth, earthly things are sanctified, the heavenly hosts are mingled with us, and the wicked one, who first deceived us, has his power crushed, as his wiles and devices rot away. * Anna, delivered by the Creator of nature from the bonds of sterility, conceives by her spouse, Mary, a daughter of God. Anna, today gave birth to Mary, the first-fruits of our salvation, the immaculate Mother of God the Word, and the first-fruits of the renewal of our nature that had been aged and tarnished by transgression of the divine precepts. * For her sake, the God-possessed prophets pronounced prophecies, and miracles are wrought to foretell that future great miracle of the world, the Ever-Virgin Mother of God. Generation after generation of vicissitudes and historical events, make a path to their ultimate destination, to the new ministry that will be wrought in her. The rites and laws had provided beforehand a type of the future truth of the Spirit. The end, or rather the beginning and root of those earlier events and wonders of God, is the annunciation to Joachim and Anna, who were accomplished in the virtues, of what was to be accomplished (in their daughter). * All divinely-inspired Scripture was written for the sake of the Virgin who begat God.